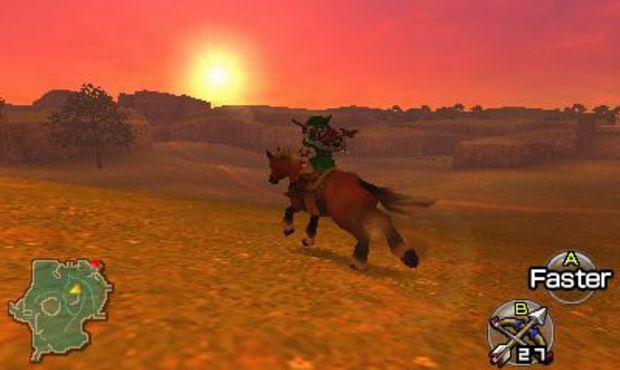 Do You Think Ocarina of Time 3D Will be the Definitive Version for You? 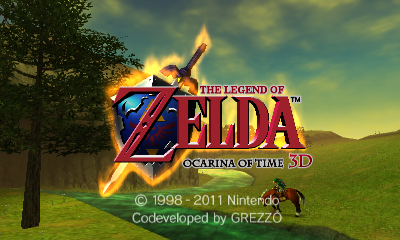 It’s obvious that one of Nintendo’s aims with Ocarina of Time 3D is to modernize the classic and do with it all kinds of things they couldn’t have done before with the Nintendo 64’s hardware. The question is: how deeply will the makeover impact fans? For many of us, the original Ocarina of Time was our childhood – red blood, crescent moon symbols, Fire Temple chanting and all. The ports to GameCube and Wii couldn’t replace those precious early N64 versions; can a true remake finally achieve what these could not? This is one of the big challenges that all remakes face – can they retain all the magic of the original while at the same time giving it features tailored for a new audience? As much as I can tell given that I haven’t actually played the game, the answer’s looking like a solid “yes” for Ocarina of Time as far as I’m concerned. I’m no whore for pure graphical power, but I am a very visual person, so an appealing presentation is very important to me nonetheless. 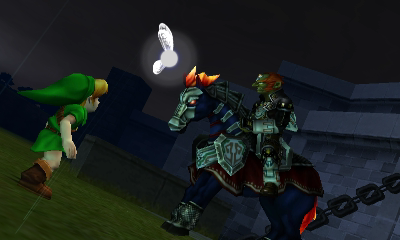 Ocarina of Time 3D just positively blows the original out of the water in this respect. While this is pretty easy to notice in comparisons between various landscapes, such as Hyrule Field or Death Mountain, what really seals the deal for me is the copious amounts of change they’ve made to areas like Castle Town, the interiors of houses, and even the tiptop of Ganon’s Tower. Don’t get me wrong, I still think Ocarina of Time was freaking gorgeous in 1998 – but now it’s gorgeous all over again. And, honestly, in a lot of ways I get the same tingly feeling I get from an all-new Zelda game when I look at the world, the characters, and the dungeons. The fact that the gameplay remains largely the same, only streamlined to take advantage of the 3DS’s capabilities, means that there’s nothing to fear in terms of monumental changes in terms of feel. Manipulating your inventory with the Touch Screen is just about the most genius way to make 3D Zelda work on a handheld, and adding gyroscope aiming capabilities (optional ones, no less) means that now there are even more ways to play. If you like the new additions – fine. If you don’t, well, there’s no reason for them to get in the way of your enjoyment of the experience. There doesn’t seem to be much in the way of actual new content – just new features that manipulate old content for your enhanced enjoyment. This doesn’t really weigh too heavily against the “definitive” question, however, since new content isn’t really the concern – it’s the presentation of the original content that’s important. Nonetheless, the changes to Master Quest seem to, without a doubt, establish it as the true Ocarina of Time Second Quest, with its mirrored world and greater damage ratios along with the dungeon remixes already introduced in its original incarnation. Plus, there’s the fact that this is freaking Ocarina of Time on a freaking handheld – and I haven’t even mentioned the stereoscopic 3D. It’s about the least important thing in my book, but after what I experienced with Pilotwings Resort a couple months back I’m definitely a little more than just curious to see it for myself. It’s this healthy blend of new + old + portability that makes me confident that this version of Ocarina of Time is going to be the version I come back to over and over again in the years to come, the one I replay during my obligatory Zelda marathon each year, the one I show to my hypothetical kids 10 or so years down the line. I’ll find out for sure in the weeks to come, but I’m personally pretty damn excited. Anyway, enough of what I’m sure many of you find is mindless PR parroting on Nintendo’s behalf – there have to be some of you who disagree to your very cores. We here at ZI love debates – they’re one of the driving forces behind our founding, after all – so feel free to contest anything I’ve said here in the comments section. And if you’re loving what you see as much as I do, don’t be shy – share those insights as well! Of course, don’t feel limited to talking about this on our main site – you can also talk about this in the topic on our forums! It’s free to join and our forum software is easy to use. Hope to hear from you soon!